At a June 12 appearance in New York before the Council on Foreign Relations, Hillary Clinton made the familiar argument for ending the US trade embargo against Cuba, the same one critics of the policy have been making for years. "The embargo is Castro's best friend,"the former secretary of state said; it provides the Havana regime with "an excuse for everything." Scrapping sanctions would "change the psychology of this issue" and improve US relations with the rest of the hemisphere. So "we should advocate for normalizing relations and see what [Cuba's rulers] do." A few hours earlier, Cuba's rulers had been doing one of the things they do best: persecuting peaceful dissidents. More than 40 pro-democracy activists were rounded up on June 11, and several were allegedly beaten by security agents. One of Cuba's most respected dissidents, Jorge Luís García Pérez, widely known as Antúnez, said he was battered and choked into unconsciousness in a police station in Santa Clara, according to the Miami Herald. State security officials warned Antúnez to stop collecting signatures on a petition condemning international efforts to reduce US sanctions against Cuba. By the time he was arrested, more than 830 Cuban dissidents had signed the appeal. In Cuba, as in the United States, it requires no bravery to publicly oppose the embargo. Cubans who publicly support it, on the other hand, risk being prosecuted for committing a crime punishable by up to 15 years imprisonment. Clinton's critique of the US embargo drew attention because she is a potential candidate for president. 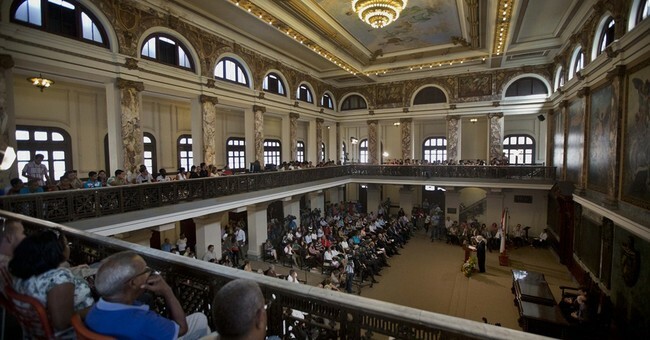 But what really merits the headlines is the courage shown by the hundreds of ordinary Cuban citizens openly urging the free world not to do more business with the dictatorship that for so long has kept Cuba on its knees. Conventional wisdom holds that the US embargo has persisted only because Cuban-Americans in Florida, a key voting bloc, strongly defend it. Florida International University generated some media notice last week with a new poll showing that by a narrow majority, Cubans living in metropolitan Miami — the capital of the Cuban American community — actually oppose the embargo. Critics quickly flagged some glaring problems with the poll, such as the 90 percent of respondents who claimed to be registered voters, while only 62 percent said they were US citizens. And the reported results filtered out the "unsures," which on the embargo question amounted to 12 percent of respondents. Including those numbers in the overall tally would show 45 percent against the embargo — a plurality, not a majority. Yet the focus on polling data is a distraction. The US economic embargo is not the cause of Cuba's misery. The Castro tyranny is. Unilaterally repealing the embargo would not weaken that tyranny by flooding the island with American tourists, consumer goods, and democratic notions, as sanctions opponents romantically imagine. Nearly three million tourists already visit Cuba annually, hundreds of thousands of Americans among them. In recent years, more tourists have traveled to Cuba from the United States than from any other country except Canada —and their numbers have been rising. The trade embargo is far from hermetic. Since 2000, US exporters have sold close to $5 billion in food, agricultural, and medical goods to Cuba — for several years, in fact, the United States was Cuba's fifth-largest trade partner. Meanwhile, Cuba has had the rest of the world to do business with, unfettered by embargos or Florida politics. If tourism and trade were going to undermine Cuba's Communist regime, it would surely have toppled long ago. But engagement with totalitarians doesn't turn them into free and democratic neighbors. Rather, it empowers them to crack down on their subjects with even greater impunity. According to Elizardo Sanchez, a well-known human rights activist in Havana, detentions of dissidents have spiked, reaching more than 3,800 in just the first four months of 2014, far above the previous high of 2,795 two years ago. The embargo, or what remains of it, is not chiseled in granite. It is, however, codified in US law. The Helms-Burton Act, signed by Hillary Clinton's husband in 1996, allows the embargo to be lifted once the Cuban government legalizes political opposition, frees its political prisoners, and schedules democratic elections. Cuban dissidents insist on that point at the risk of going to prison. Shouldn't American politicians, with nothing at risk but their credibility, insist on it as well?